Registrations for camping at Warburton Primary School for Warburton Trail Fest for are now closed. In need of somewhere to stay over the Salomon Warburton Trail Fest weekend? If you have done your searching on the Google-nator, you may realise that being a long weekend, accommodation is tight in Warburton, including our friends at the Warburton Holiday Park (they book out nearly 12 months in advance!). But you're happy camp? And also be chuffed to raise money for a good cause, that being the local Warburton Primary School? Well, we have the solution. 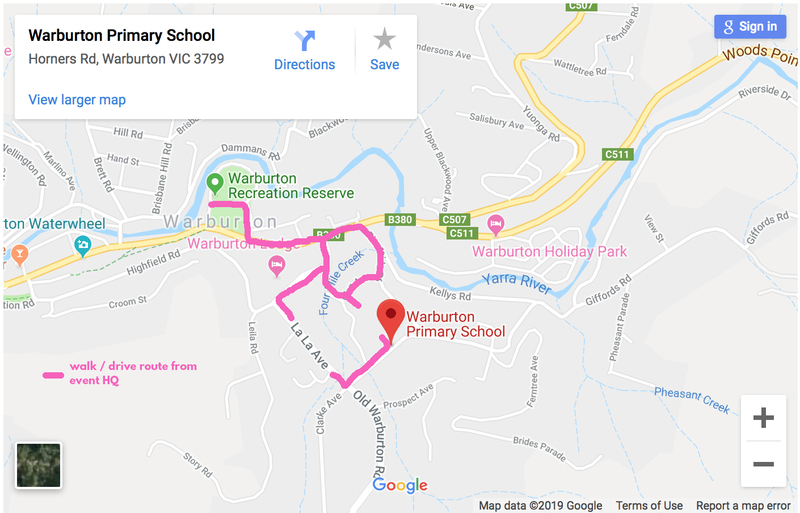 You can now CAMP at the Warburton Primary School oval, which is a rather idyllic location within walking distance to the Warburton Trail Fest HQ. It's flat as a pancake (hey, it's an oval), has three playgrounds on its perimeter (great for families), a bunch of picnic tables, running water and toilets, and even a huge undercover area outdoors should the weather turn! Remember that the booking system is per night, per person, so select the option that covers the correct nights you want, and then order multiples of that according to how many people are in your tent.